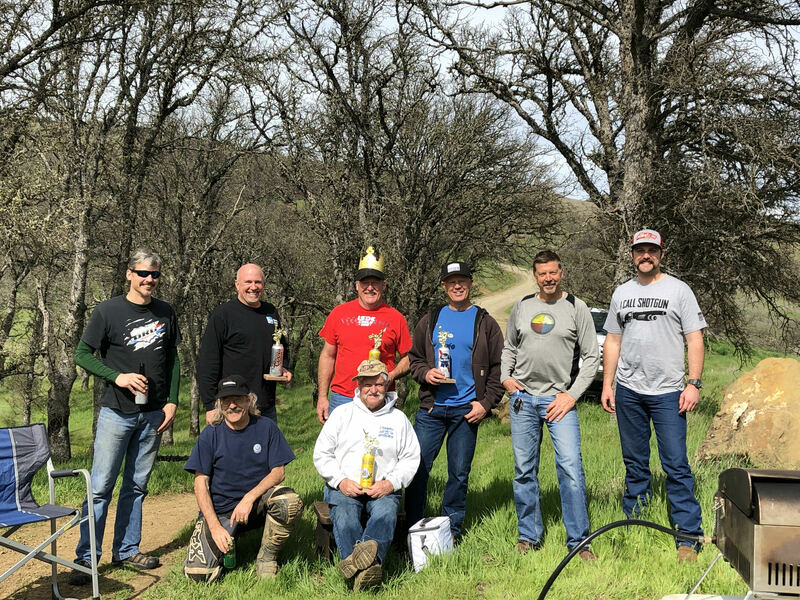 It was a great day for NBMC at Indian Valley Reservoir with spirited racing, “mechanical adventure”, and a post race bbq/trophy presentation in sunny 70 degree weather. 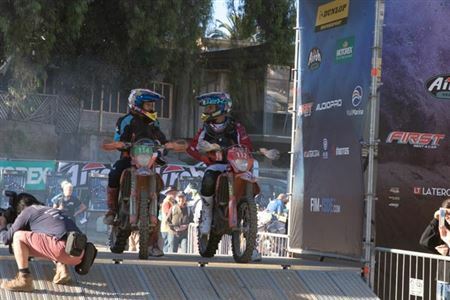 The Qualifier style event totalled 65 miles with 4 test sections contested. Test 1, a twisty sprint in a couple of draws was short and sweet. A hard left turn (which was very well arrowed…. ), where you transitioned from one draw to another was “overshot” by several riders. “Rocket Ron” McDonell topped the scoresheet over Trevor “T-Dog” Froman by 2 seconds in the early racing. Test 2, a “game trail” width rolling climb through brush put everybody in cardio-mode. Perennial contender, Trevor “T-Dog” Froman lost the front wheel of his gas guzzling RM over the edge on an off camber section. A broken kickstarter turned him into the “marble in the funnel” and all hell broke loose. T-Dog fell from contention and Papa Froman took the test by a mere 2 seconds over Matt Finnegan. Test 3 was twisty, tight, up and down, and varied. It started with a bit of rock, a little creek crossing, and then a steep drop into a draw with a sharp “V” that had to be dealt with at the bottom in order to get out the other side. This “V” was the site of the most spectacular crash of the day as Gary Breazelle and his Beta went helter skelter, upside down, into a hole on the downstream side. After the test was completed it took a handful of folks to extricate the bike, which amazingly came out damage free! Results for the test went, 159 Papa Froman, 161 Matt Finnegan, and 162 Trevor Froman. Test 4 was a all out, full speed hill climb that all agreed was the most fun of the day. For the length of the test it was amazing how close the scores were for the majority of the racers with Trevor at 127, Finnegan at 128, Mike at 128, “Wee” Will Power at 129, Rob White at 131, and Ron McDonell at 131. It was in this test though, that the Prez put the hammer down and separated himself from the pack with a blistering 118 to take both the test, and the overall for the day! 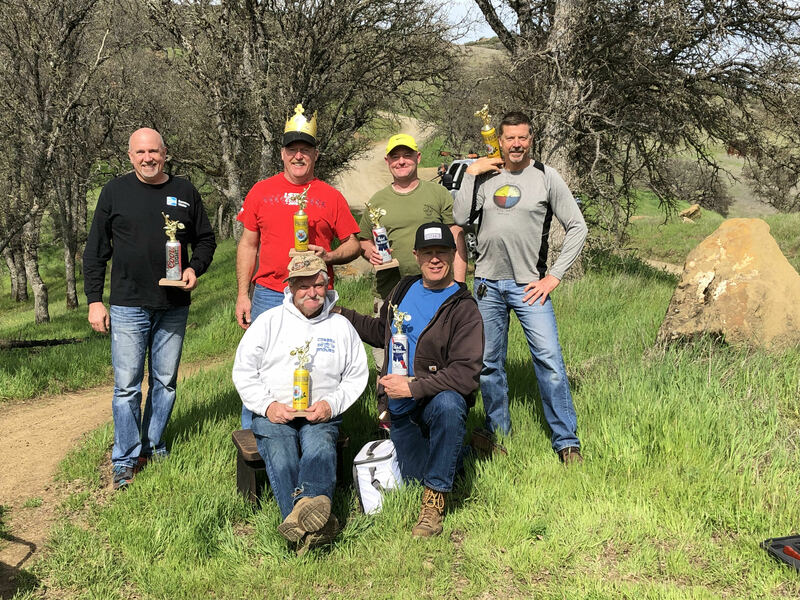 Congratulations to the 2019 King of the Klub David Froman! 3rd place…. Involved a long discussion about the rules of racing while burgers and beers were consumed and I don’t know if it was ever fully resolved…. It will probably come up during “unfinished business” at the next meeting. The Pioneer class was absolutely dominated by Jimmy Long. Jimmy was a little sheepish about the fact that it was his 71st birthday yesterday. What a way to spend your 71st and so glad you came out Jimmy! We will be posting news and photos from the event. Several club members are attending to help support the U.S. team. So we are all here safely and ready for the event. We left SFO at 11:59 AM Sunday, and arrived in Chile about 11 AM Monday. A long flight to say the least. At the airport in Santiago there were many riders arriving also. You could tell by the gear bags and suspension boxes being picked up at baggage claim. From there we went to get our official US team van which the 7 of us are to use to run check 2. Sadly it is a cargo van and only seats 3! Karin and I are staying in Santiago for a few days so Dave gave us a ride to our hotel while the others waited for Adam Froman to arrive as he also had a car reserved. That brought us to the next adventure, which is navigating around Chile! `It's like Italy in that all of the road names are at least 3 long words that won't fit on a sign, so they abbreviate them in a way that doesn't make much sense if you speak English. On top of that one way streets change direction depending on the time of day. Traffic is bad, parking difficult and it's somewhat smoggy. The city is very clean, but get out of town and trash is piled up everywhere. Today,Tuesday, the USA container arrived so those at the site helped unload it and get the riders set up their work space. The rest of the week will be spent locating our checkpoints, walking tests with Adam, and stocking our van with water, food, and anything else the US team might want. On that link I sent out with the maps you will be able to see daily results, teams photos and such. I don't have any news from the enduro site to post today, I am still in Santiago. The weather here is warm, high 80's. They say it's about 10 degrees cooler at Vina Del Mar where the event is, but still on the warm side for 6 days of endurance racing. It has not rained here in several days, but there is a chance of rain forecast for Saturday. Karin and I hiked to the base of a glacier in the Andes today. It's dusty but there is moisture just below the surface. Hopefully the event won't be too dusty. The mountains are also very rocky, similar to the Idaho Sawtooths. I wonder if that's what the riders will face when they head into the mountains on days 3 & 4. Here in the city, motorcycles are everywhere, unlike other European cities where scooters are the norm. It's mostly 200-250cc singles, lots of dual sports. I also see many Repsol Honda paint jobs and Suzuki's called Gixxers that look to be 200cc singles also. How about a KTM 200 duke, and lots of brands we've never heard of. I do see a full size bike once in a while, but not often. Gasoline is 860 pesos per liter, which works out to about $1.20 per liter, or about what we pay, diesel is a bunch cheaper so most small trucks and many cars are diesel. Friday is Karin and I's last day in Santiago. I will be very happy to get out of this city and to the enduro site! It's been interesting being here, but for me 2-3 days in a big city is plenty. Got to keep the wife happy though! Today we went to the two "hills" in the city Santa lucia and San Christobal. Both are now city parks and very well kept. It gets you up high enough to see how bad the smog really is! I had been wondering why we have not seen any older vehicles on the road, and smog is why. If your vehicle does not pass the current smog rules you are not allowed to use it on bad air days, which I was told is about 7 days a month during summer and twice that in winter. You also see dogs everywhere running loose. They are strays, but well fed and cared for. People leave food and water out for them, and some parks even have community dog houses for them. They have recently started picking them up and neutering them too slow down the population growth. People here love dogs and they are mostly well behaved and friendly. Eating in Santiago is reasonable and quite good. Breakfast is granola with yogurt, meat & cheese, bread and coffee. Lunch is an empanada or torta. We had an empanada each and fresh peach juice today from a corner market and it was 3000 peso's or about $5 for both of us. A very nice seafood dinner with cocktails set us back about $75, way less then it would cost at home. Got into Santiago yesterday. Driving down here is challenging and finding our way around takes a while. Kind of like Baja but little better. The homes are finished. Got to the U.S. team pits today around 10. The U.S. team all went over and put the bikes into impound this morning. Had lunch and some Chile beers. At around 1 pm Steve Terri Froman and I went out to our check point. Took 45 minutes to get there. Met some people from Argentine had a good bs session despite the language barrier. It was a blast but since we all ride it worked out. Went to look at the check point for days 3 and 4 but kind of got it wrong. We showed up just in time to for me to ditch Steve and Terri to walk a special test with Adam and Trevor. Terrain kind of a mix between Baja and home. 4.5 miles special test. Some real challenge off camber with turns in the middle creek sections like home one short section of big rocks/ boulders. Food here leaves something to be desired. I Just got back from the Sunday night team meeting. The first rider leaves at 8 AM, the last at 11:30 AM. The U.S. team is towards the back based on last years results. Adam is on the 3rd to last row. The team plan is to to move up by posting fast times on day 1. Each day's starting order changes based on the days results. The riders are all excited and ready to reclaim the trophies! For us, service check 2, our day starts at 6. We have to load the riders personal supplies in the van and be on the road by 6:30. We have a tent to set up, gas cans, enviro mats, bike stands, water, food, wash towels and more to bring. We have to greet the riders and find out if they are on time or late, and figure out the time they need to leave our check by. We can gas up their bike for them, but won't do so unless they ask. It's very dusty so many riders will be changing air filters if time allows. Adam has 10 filters and will probably use 3 per day, so we will be cleaning filters at night. KTM brought 700 filters for the trophy team and will just throw them away. Got to keep the 2 st gas separate! They go right in to a special after us that ends there too, so we get to see some action also. I hope to have some good action pics and results tomorrow! Things are going well for the U.S.team. The lead has been going back and forth between us and Australia. Taylor Robert was the overall leader last night and held it through the middle of today when we closed our check. We have several riders in the top 10 and all of the teams are within striking distance of the lead. Adam Froman ended the day needing stitches in his elbow, but he moved up over an hour in start position and was 42nd in club riders. A very nice result, in gold medal contention.Today was going better for Adam as he took as much as 15 sec. off some of his test times. He is riding around riders closer to his speed now that he moved up so he has fewer passes to make in the tests. He is feeling good and is very focused on his goal, which is to earn gold. New terrain today. It looks like stuff that would be a lot of fun with a little moisture and cooler weather. It was so dusty today they skipped one test to give the riders a break. That meant we had all of the club riders in our pit at the same time, all wanting to do maintenance or repairs like oil changes. It was very hectic, but NBMC pulled through and we got all of or riders out on time. The riders are eating and drinking a lot more than on day one so that necessitated another shopping trip. The results continue to be good for the team, and Adam was holding onto gold as well. Since the results are available elsewhere, and I don't see them until late tonight I'll let you get them elsewhere. Destry Abbott dropped out today after crashing so hard he broke his helmet. He rode on to our check but was in too much pain to continue and went to see the doctor with his Dad. At Parc Ferme tonight, there he was coaching his son Cody as any father would want to do. Because I think there's a lot of info about the riders out there, I'll tell you how our day goes,Service check 2 & 5.
arrive at our check about 8:00, then unload,set up 2 15 x 20 easyups, set up mats and stands for 12 riders, food, drinks, tools, supplies, prep gas cans and more. we are usually done by 8:45, which gives us about an hour to relax. riders start arriving around 9:30, and usually have gone thru by 11 A.M.
We have a couple of hours off for lunch and to visit with the other crews. About 1P.M. riders start cycling through again as the course is 2 loops each day. Done by 3 P.M., everything has to be torn down and reloaded. Then it's into the traffic in a race to the pit's. If traffic's not too bad we get there in time to watch for a bit before Adam arrives, then Dave and Trevor get everything ready for Adam's 15 min work period. Today the pits were busy so Karl and Steve got assigned to help Eric Kudla. Next up is refilling the fuel cans and replenishing our supplies. Some things we can pick up at the pit's from AMA, some we go to a local store and buy with AMA's money. Back to the team hotel, sometimes with enough time to shower before dinner, sometimes not. After dinner, it's team meetings, write this story and make lunches and rider food for tomorrow. We make 15 PB&J cut into quarters, cut up fruit and snickers bars for the riders. We also make lunch for the 10 of us which includes Adam's wife Mallory and 2 KTM factory mechanics who talk riders through repairs. With luck it's bedtime by 10, then do it all again tomorrow!. In tomorrows installment I'll tell you what actually happens in our service check. The FIM jury decided last night to skip test one today because of the dust. Trophy and Junior T riders will get 30 sec between riders in tests, everyone else 20. That's up from 15 sec. That will make our day longer but safer for the riders. Riders speeding on roads continues to be a problem so they have added more transfer time too. Taylor Roberts continues to lead, all of our teams are solidly in second but losing ground to the leaders. It's very difficult to make up time and pass so it's going to take some luck for us to move up. Taylor has a huge advantage being out first every day and should continue to lead if he doesn't have any problems. It was a so so Day for team USA today. 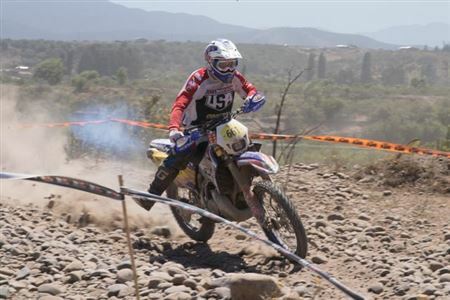 The extra time between riders improved the scores for everyone, but Brian Sipes got delayed by an accident on the road and lost a route point. Hopefully the jury will remove it tonight. On the women's team Brandi keeps setting very fast times, but so does the top AU rider. Otherwise we seem to be creeping back into contention for the win. Our man Adam set a couple of very good times today, one as high as 25th club rider! Unless something happened late I don't know about, he remains on gold and is inching up. Adam is feeling well and is extremely fit. Barring any problems tomorrow I expect he will go past quite a few tiring riders. Club rider A.J. Lehr dropped out today. He injured his back in a bad crash yesterday. He hoped it would get better as the day went on but by the time he got to us he could barely stand up. So what exactly happens at a service check you ask? We are placed just before a timed, or "route" check. The riders know where it is and can get there early as long as they don't cross the check line until their minute. So they get to us with some spare time, and as the week has worn on they need to do more and more maintenance or repairs. When the T and junior T riders come in, most have a chase rider and/or family there waiting. We gas the bike and provide whatever else they might need, but mostly they have it all covered. The KTM guys look the bike over closely and supervise any work being done. They have parts with them, but only provide them for supported KTM or Husky riders. They do help everyone regardless of brand. When the club riders come in it gets very hectic. Some of them have help too, but most rely on us. We do several oil changes each day and hand them tools and supplies as needed. We are their extra eyes as well and inspect the bike closely. We have spotted a couple of missing bolts and a coolant leak that the rider was unaware of. One of us keeps track of the time and reminds the rider how much time they have left. The last thing we do is send them of with a big cheer! Today was the first day of vintage competition. It was fun to see the old bikes go by. I saw a Cooper, 2 SWM's, An early KTM, a XR250 and a few other strange brands. They were behind all of the club riders and I wonder if the top riders had to pass them on their second loop. We got back a bit early today, so were going to skip the mediocre Team food and go get a "Hamburgesta" at a bar down the street. I've seen pics and will take one for you. KTM is the #1 brand, but not by much. Husky is right there, in fact I think more top riders may be on Husky. From there it's hard to say who is next. Maybe Honda, but there are a lot of TM's, Beta's and Sherco's too. A few Yamaha's, fewer Suzuki, and I have only seen 1 Kawasaki. Interestingly the 4 man Japan team rides Betas! The U.S. team has a choice of Dunlop or Metezler FIM tires. The Dunlops are almost bald by the end of the day while the Metezlers can go 2 days if needed. Everyone runs pump gas rated 97 octane, but I don't know which method they use to rate octane. Spectro supplies all of the oils and lubricants, and the 2t's get 40 to one. It's all free to the riders so nobody complains. The ones who have sponsorship obligations try to do their oil changes at Parc Ferme if possible so they can use their product.As the temps have gone up a few of the 2T riders have had to rejet. That makes for an interesting service stop when the needle clip gets dropped on the service mat! The smaller teams use KTM pit service if that or Husky is their brand, or one of several independent services. The pit right across from us is huge. They must service 60-70 bikes twice a day. With every brand you can imagine and several languages being spoken it gets to be a keystone cops type of show at times! A couple of corrections from yesterday. The 2T fuel is 50-1, not 40-1. There are more Yamaha's here than Honda, they are probably #3. There are also a lot of GAS GAS bikes on the course. Not as many chase riders as I expected. A few are riding replicas of competitors bikes, and I've seen some parts being removed from them. Most are just used as a way to get around to check on their rider. I write this when I get back and before I know what the last 3rd of the day brought or the days scores, so it's not up to the minute. 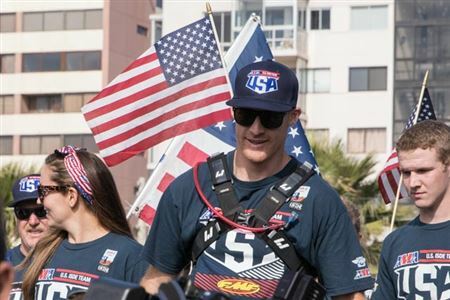 Taylor has dropped to second overall, still top American. We seem to be stuck in 2nd with little hope of regaining the lead unless the 1st place teams have trouble. The Aussie T team is down to 3 riders so if someone falters we are poised to take over the lead. We have all of our teams T, JT and Women's intact, but too many mistakes have hurt us. We will have 2 great tests, then a really bad one for the most part. Adam has fallen back to Silver, but still has a chance to get gold. In this old racers opinion, many of our riders are pushing just a bit too hard and crashing too much. Everyone badly wants to win and is trying their best. Many riders are tired today and struggling a bit. They are eating and drinking more than before, and don't leave the check until the last minute. Everyone is smiling though, both a little sad and a little grateful that it's almost over. Dave, Terri, Trevor and Mallory Froman left the check early (we chased Dave out) to watch Adam Froman in the remaining tests. Karl, Steve, myself and our KTM guys Chuck and John took over and got er done. Karin leaves us early and walks to take the photo's you are seeing. She's taking about 1k pics a day! She will edit it down to a dozen or so of each rider and put them online for all to enjoy when we get home. We got done early today as we didn't need to resupply. Tomorrow we have......nothing! We get to spectate at the motos, then will go help team USA pack up before awards. The party is going to be epic Sat. night! It's definitely bittersweet as the event winds down. By now we know the riders by first name and they feel like family to us. No mater how their day is going, they always have a smile and a thank you for us. Everyone here, riders and support, make us proud to be an American. We will miss seeing them everyday for sure. I've not seen anyone refuse a photo or autograph even in the middle of the event. Taylor is a rock star here, all the girls want to meet him! Team Spain helped us out one day when we were backlogged with riders, the Aussies and Germans always have a joke to share, and everyone asks about the fires back home and how are we holding up.It's competition to be sure, but it's 6 Days, and everyone understands it's about the shared experience as much as the competition. There's problems to be sure and I might write about them after the event, but this is truly amazing and I'm very glad to be here. Adam made it back to gold by 1 second on day 5! He is 24th in club riders. The moto's are critical for him to stay gold. They have to ride 23km out to the track and re-impound the bikes. They get a 30 min. work period then 1 sighting lap before their race. The track is all beach sand with some man made table tops and rollers. It may get whooped out quickly. The club riders and women go 5 laps, everyone else 7. They race in reverse order with club riders first, so Adam will be in the 2nd race and get a fresh track. After the motos they impound again where the transponders are removed and the bikes are inspected by FIM. The medals will be given at the track, then the riders will return to Parc Ferme and start re crating their bike. We have to wait for customs to inspect every serial #, then the container can be repacked. After that we return to our hotel and the party starts! We can sleep on the plane Sunday. If there is plenty of help for loading I will come back and write about the moto's. Today's results mirrored the whole week. Taylor Roberts, #111 got into the 1st turn 3rd, but tucked the front wheel and went down. He was run over by a couple of riders but still remounted and charged forward impressively. I think he ended up 7th. Josh Toth (114) and Stewart Baylor(116) battled hard and I they finished ahead of the Aussies who crashed together on lap 1 ,, but it wasn't enough to move us past them. I'd bet they were riding conservatively to avoid a DNF. Ryan Sipes (110) started well and moved up to 2nd, a great ride. Zach Bell, our hero (113) started 3rd, was in 1st by the end of lap 1, and had a 12 sec. lead after 5 laps! Everyone rode their hardest even on day 6. Our man Adam Froman (860) had a decent start but was involved in a first turn pile up, then another rider fell in front of him causing him to go off course. So his dreams of gold went out the window, but silver is great and he beat his Dad's 1994 result! So we were asked to avoid saying anything negative during the event, and I didn't. This was not a well run event. They got it done, but everything was last minute and not well thought out IMO. 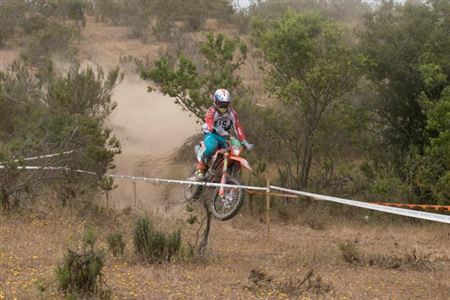 I have been involved in putting on enough local enduros to know that the one thing you can't control is conditions, and that the conditions have a tremendous impact on peoples view of the event. What I will criticize the promoter for is not having a prepared solution for the dust. Riders should never have to ride the same test 6 times in these conditions. You can see in the posted photo's riders cresting a hill with the valley in the background. That hill had rain ruts in it tank deep the first time, but there were good lines to use. By the 5th time thru you couldn't see the ruts because they were full of silt. They did skip one test in a valley that had no wind to blow the dust off, but that only happened after someone got hurt. They had no solution for the traffic. It was bad anytime, everyday, and then they were mad at the riders for splitting lanes and speeding to stay on schedule.The Police threatened to stop the event at one point before they finally added some time to the transfers. Even the Chilean riders were asking why are we riding this sh**t again when there's plenty of good riding right over there? All that being said, even after I spent 2 weeks vacation and a large amount of money, I'm glad I came. This is very special, and to have a small part in it is even better. Think about supporting a 6 days rider in the future, or go to one yourself and pitch in. Many of the volunteers have been going for years and warned us it can be addicting. It is fun! I'll be going again, maybe Italy. 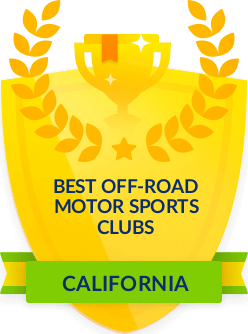 Friends of Cow Mountain, a 501 (c) (3) non-profit, seeks public comment for off-highway (OHV) grant application Ukiah, Ca, March 6, 2017 - Friends of Cow Mountain, a not for profit , is seeking public comments on a preliminary application to the State of California Off-Highway Motor Vehicle Recreation Division (OHMVR) for the 2016/17 grant cycle. The public review and comment period for the State’s Grants and Cooperative Agreement Program begins March 7, 2017, and ends April 3, 2017. State regulations require annual public participation in this fund allocation process. The Friends of Cow Mountain will be submitting the application using the California internet-based “On-Line Grant Application” (OLGA) software. After the public review and comment process a final application will be submitted by May 1, 2017. The public may view and comment on the preliminary application by visiting the State Grants and Cooperative Agreements Program website at www.ohv.parks.ca.gov and select the Grants tab. The OHMVR Division’s website will provide further detailed instructions for accessing the preliminary application and submitting comments. The Friends of Cow Mountain application is focused on improvements to off-road vehicle routes at South Cow Mountain Off Highway recreation area. this photo is from the pre-ride. Check out more on our photo page!